If you asked me about the best way to travel to Kinnaur valley then I will definitely recommend by your own vehicle. But that is not really a choice for everyone due to multiple reasons. Some people do not feel comfortable or confident enough driving through the hills; while others live a bit too far away to bring their own car or motorcycle. Whatever your reason be; but if you too have been thinking about visiting Kinnaur by public transport; then below in this article is the schedules of Bus service in Kinnaur valley which I am sure can be of help in planning your trip. Please note that all these are ordinary HRTC buses that ply between local towns and villages of Himachal. These are not luxury, deluxe or AC Buses and there is no booking system available. It is like you will catch a local bus in your own city from one destination to another; you reach the spot, board the bus and buy the ticket. 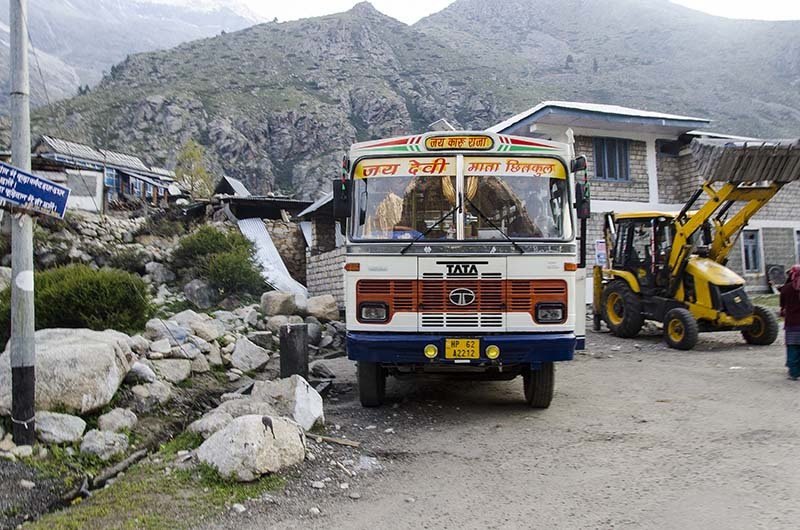 Some of the buses travel within Kinnaur itself; while a few others are actually for other destinations, but can be used to reach and explore Kinnaur valley. Frequency of these buses is still not that great due to which the locals rely a lot on shared taxis as well. If there wasn’t a bus available as per your timing; or you missed a particular bus then you will definitely be able to find a shared cab going your way. This is a daily bus service between Shimla to Reckong Peo and then Reckong Peo to Kaza. It travels through almost the entire Kinnaur district and is your best bet in terms of moving from one town to another. It starts from Shimla at 7 AM and reaches Reckong Peo by evening. From Reckong Peo, it again starts at 7.30 AM the next day and reaches Kaza by evening while traveling through the villages of Pooh and Nako. There is a daily bus from Shimla to Sangla that starts at 6.30 AM. You can use this bus to travel directly to Sangla and then further to Chitkul. It is just one bus and it usually gets a bit crowded so ensure you are reaching well in time to grab a set. If you were not boarding it from Shimla then you may not find a seat at all. It starts from Shimla at 6.30 AM, reaches Narkanda at 10 AM and Sangla at 5 PM. There is a daily bus from Sangla for Reckong Peo at 12 noon. Fare per person is about Rs. 100 to Rs. 150. This bus starts at 7.30 AM from Reckong Peo and can be used to travel to Nako. This is a daily bus from Kaza to Reckong Peo that you can use to travel back from Nako to Reckong Peo. This too is a daily bus that you can board for your journey back to Shimla. There are two buses from Reckong Peo to Chitkul daily; one starts at 9.30 AM and another one at 12 noon. There are 3 daily buses from Reckong Peo to Chandigarh; at 6.00 AM, 1.30 PM and 7.15 PM. There is a daily bus at 4.00 from Reckong Peo for Rakcham. The daily bus from Shimla to Reckong Peo and Sangla are the ones that you can board for reaching Kinnaur Valley. The fare from Shimla to Kinnaur Valley will be about Rs. 250 per person. There is no booking system available from either Chandigarh, Shimla or anywhere else for that matter. These are all ordinary HRTC buses and you will have to buy a ticket on the spot. The daily Bus from Delhi to Reckong Peo is the one that you will use to reach Kinnaur. Do remember though that it is actually a 2 days journey and you will be changing bus at Shimla. There is no direct bus from Manali to Kinnaur. You will have to travel either via Shimla or Kaza. I hope the information above on schedule of bus service in Kinnaur Valley was of help. If you have any other questions; or need any further details; please feel free to ask in the comments section below; or at our Community Forum; and I will be glad to answer.